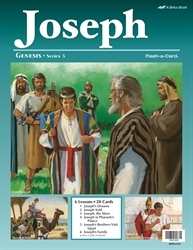 Journey through the life of Joseph with the Joseph Flash-a-Cards! These 6 lessons and 28 pictures depict this Old Testament story from Joseph’s dream, to Joseph being sold into slavery, to him becoming a leader in Egypt. Also included is a detailed lesson guide that gives you content to teach, prompts to use the pictures, and review questions for each lesson. Teach your child the importance of remaining faithful to the Lord’s leading just like Joseph.